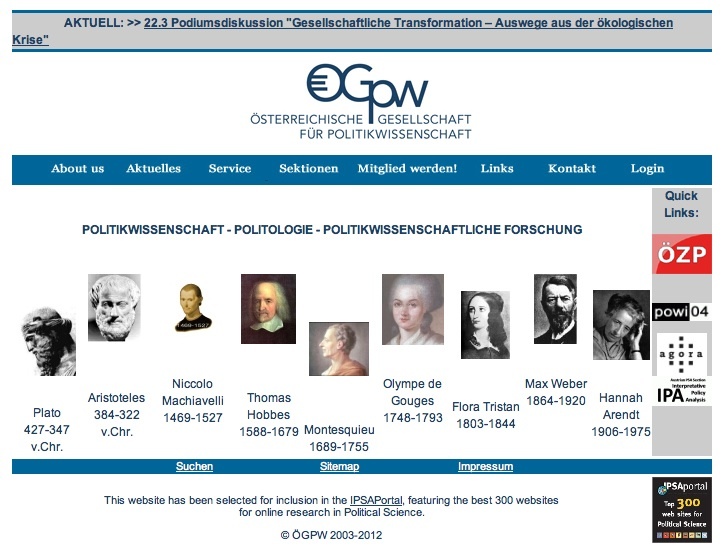 The Austrian Political Science Association (ÖGPW) was founded in 1971 and nowadays, with about 500 members, fosters research and knowledge exchange between the Austrian PS community and the international one. Along with conference and workshop organization, the association publishes its academic journal, the Österreichischen Zeitschrift für Politikwissenschaft (ÖZP), whose issues since 1996 are retrievable for free through an internal linking: abstracts, some full text and contributions’list are also available. The association has three sections, focused on democracy, political economy and comparative politics, as well as one dedicated to graduated and young scholars, each of them with a specific page in the website describing their initiatives, providing description of their projects and their meetings’programs as well as some publications (articles and books) retrievable full-text for free. The webpages of the ÖGPW are available in German only. The site is completely open and free and materials and info are retrievable by all users without any fee, but mostly they can be only saved on-screen. News, job and scholarship announcements, plus summers-schools and research grants are also frequently notified. A link list is available, pointing to external PS-related websources. The site structure is extremely simple and no navigational aid is needed to retrieve informations.